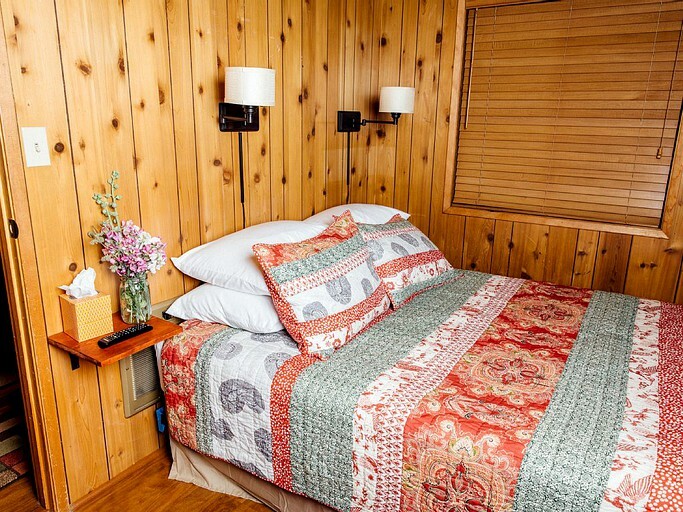 Up to six guests are able to stay at this cabin rental near Palm Springs, which has two bedrooms. The upstairs loft offers a California king-size bed, and the downstairs bedroom comes with a queen-size bed. 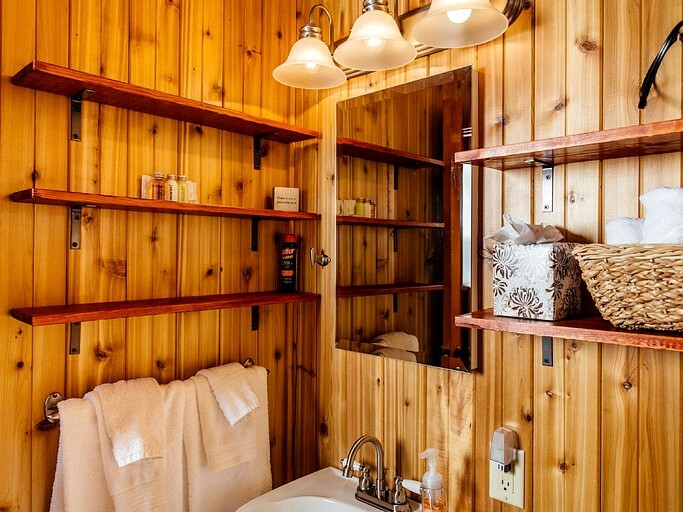 The bathroom offers a toilet and a spacious, walk-in shower. Guests who stay here will have plenty of entertainment. There will be an assortment of books, as well as board games including, Scrabble, Jenga, Battleship, Rumikub, and playing cards. Glampers will also have Time Warner's top "Preferred TV" cable with 200 plus channels. The living space offers guests a flat-panel smart TV and a second TV comes with a Roku is set in the downstairs bedroom. 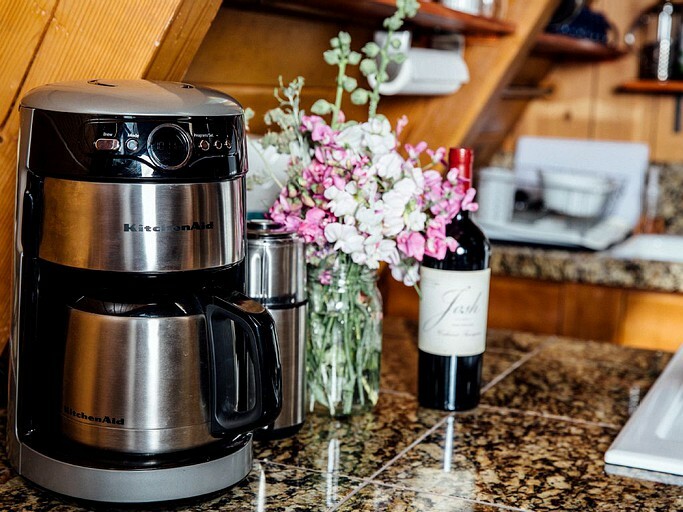 The kitchen boasts all the coffee-making essentials including, a Cuisinart coffee pot, a bean grinder, and a french press. Dishes and utensils are provided for up to six guests. There is also a Ninja blender, pots and pans, a toaster, a microwave, an oven, a stove, and a refrigerator. The pantry is well-stocked with items such as oil, salt, pepper, general spices, sugar, and travel coffee cups. For dining, guests will find a table which can seat up to four, as well as kitchen bar seats. 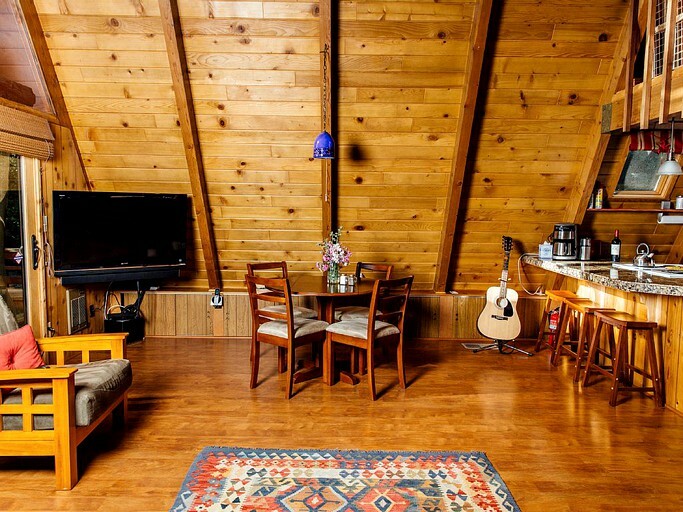 Facilities at this A-frame cabin include central air conditioning and heating, a wood-burning stove, a hair dryer, linens, and towels. Guests here will also have internet, street level parking for three cars, and additional parking. 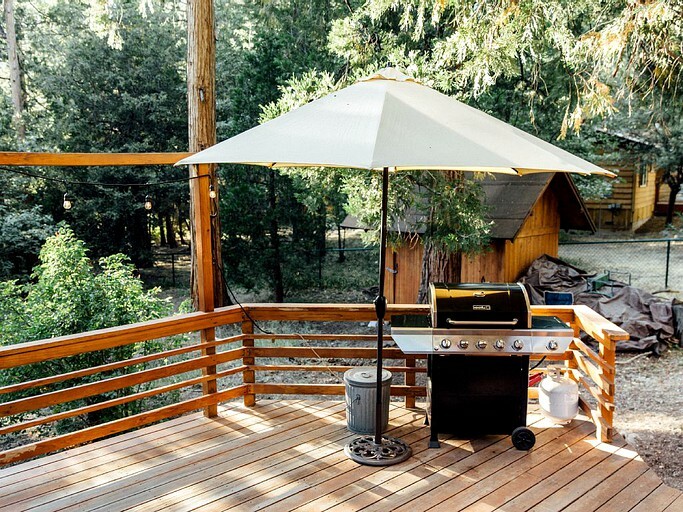 This cabin has a landline in case cell service is spotty—guests are free to use it for outgoing calls in the U.S. 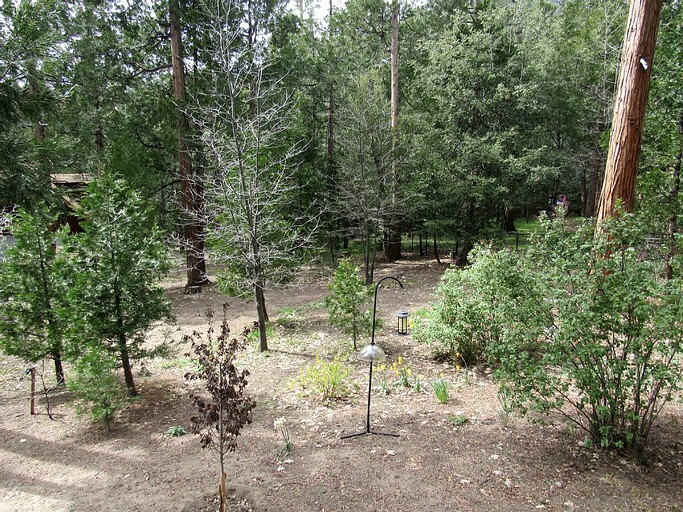 There is a fully fenced one third of an acre yard to keep guests' furry friends safe. 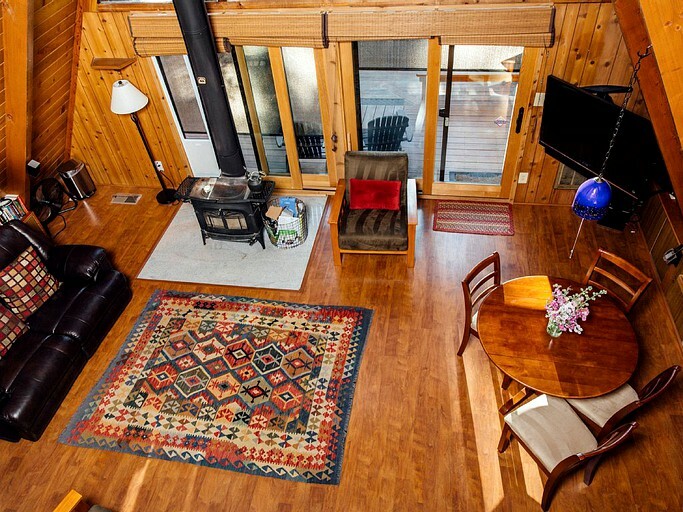 Guests can purchase wood for the wood-burning stove in town or request unlimited access to the hosts' woodpile for an additional fee of $15 a night. 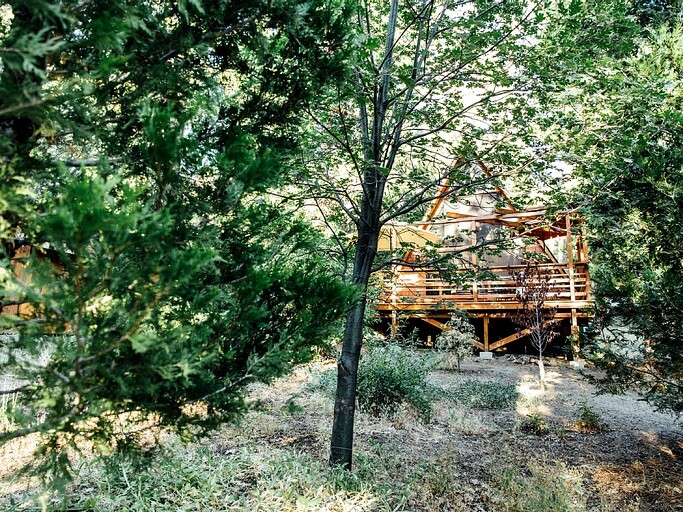 This property is set in the lovely Fern Valley, California. 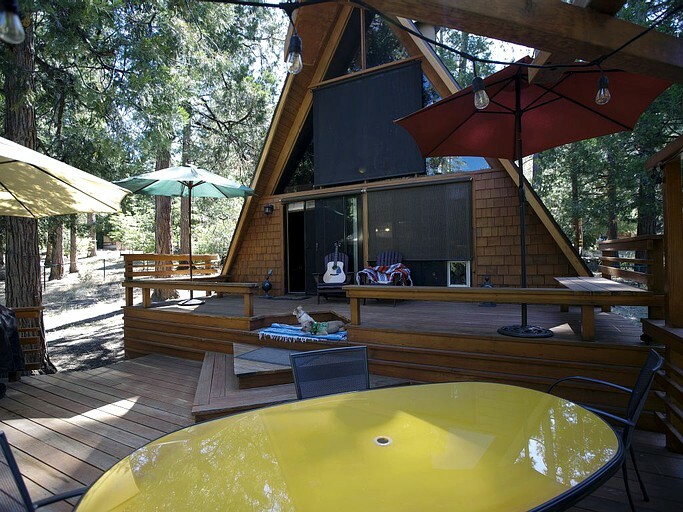 The town of Idyllwild, just walking distance from the glamping rental, calls the San Jacinto Mountains home. These mountains are located in southern California, just east of famous Los Angeles. 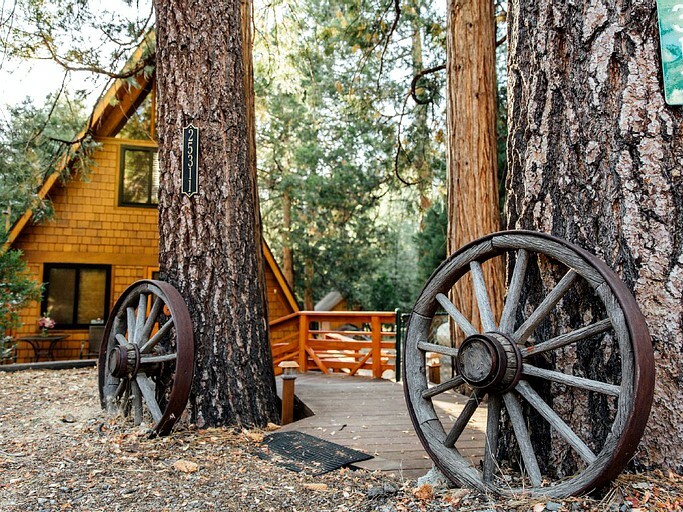 Filled with small shops and restaurants for when guests have finished their day's hiking, rock climbing, or mountain biking, Idyllwild provides a much-welcomed escape from the hustle and bustle of the big city, letting glampers get a feel for mountain and small town life. 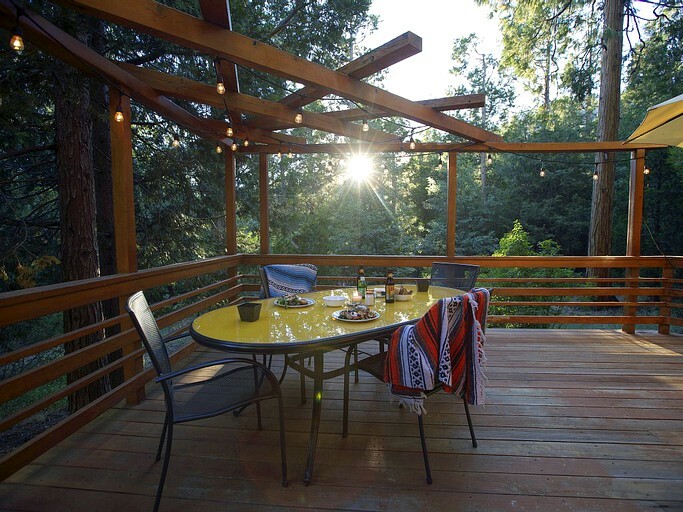 Stay here and enjoy close access to the town of Idyllwild, where glampers can head to plenty of restaurants, shops, and bars without the hassle of parking. 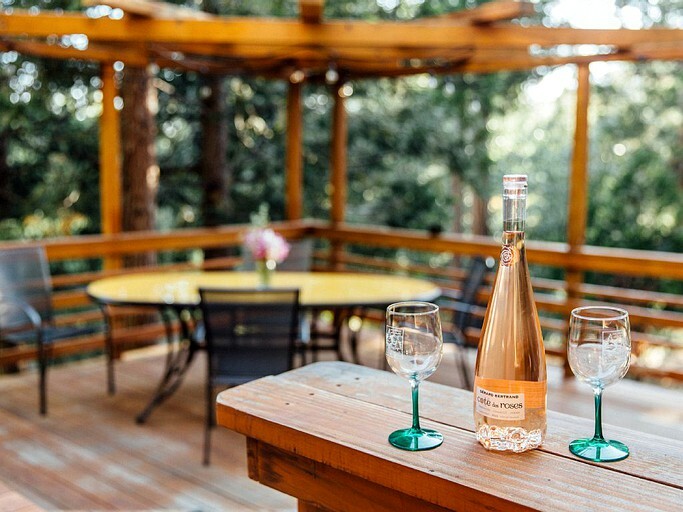 Guests are just minutes from Strawberry Creek, a lovely spot for lounging and enjoying a quiet picnic. 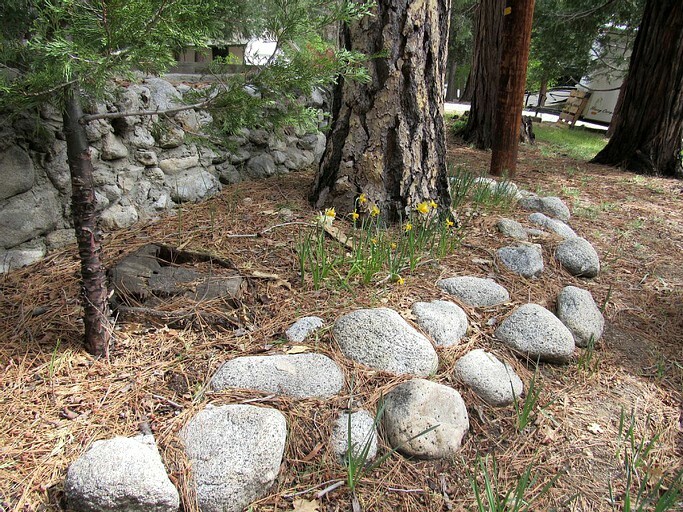 Hiking trails are nearby for those looking to explore the surrounding national parks and forests of Idyllwild. Guests must remember to register for hikes in the National Forest at the Ranger Station before heading out. This glamping site is made for both active and laidback glampers. 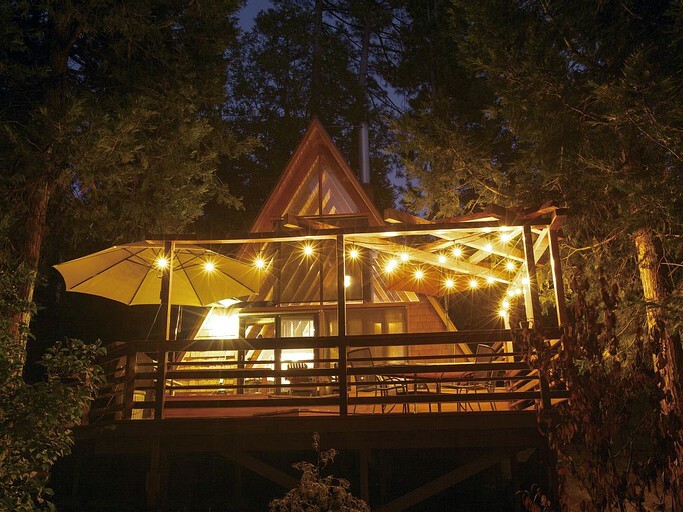 For those looking to simply disconnect in the woods and mountains, this cozy accommodation will more than take care of ensuring the ultimate place for relaxation. 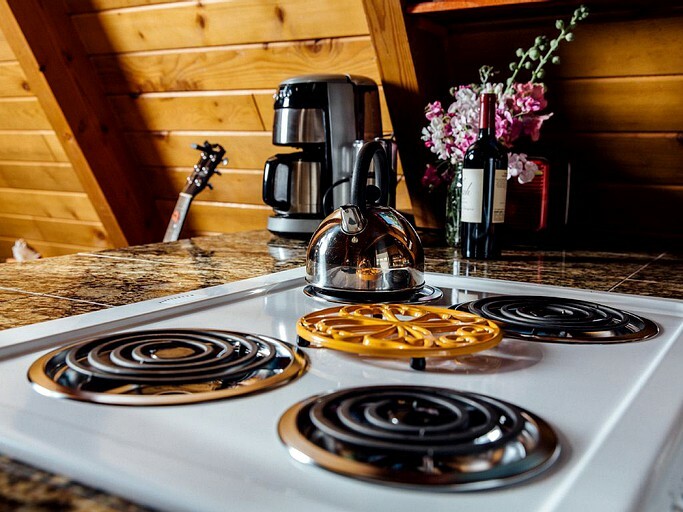 Meanwhile, active and adventuresome guests can take advantage of the area's hiking, rock climbing, fishing, and mountain biking. This property is non smoking, and pets are considered for an additional fee of $15 per night. Guests are asked to be respectful of other guests and clean up after their pets. 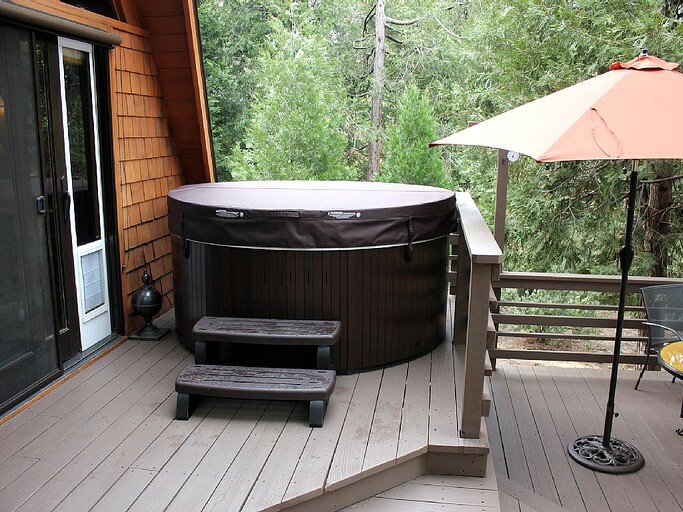 Children are welcome at this property and there is a tall baby gate to protect the stairs and fenced-in back yard.